Getting Started on Your Next Build? Go Sleek and Lightweight with our Billet Upper and SPEAR M-LOK Handguard. The slim free-float design of the SPEAR handguard enhances accuracy while minimizing the weight of your rifle, M-LOK attachment slots and included rail section provide unlimited options for accessorizing your build. Our billet upper matches the contours of the handguard perfectly, for a monolithic look in 3 different finishes. With 12” or 15” lengths available, the SPEAR handguard is ideal for starting your next AR-15 build, or upgrading an existing firearm. 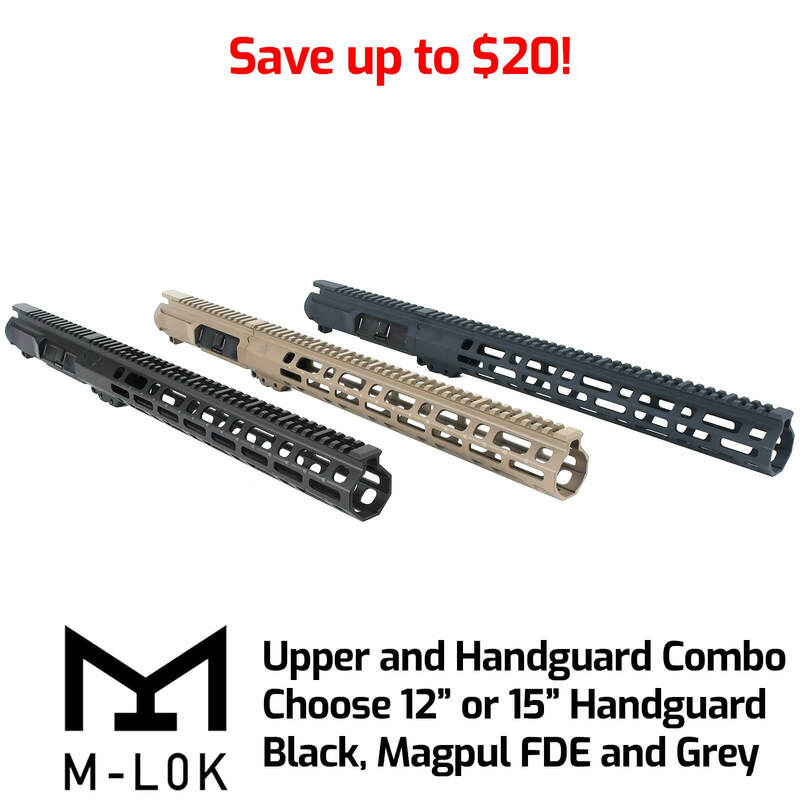 And with our selection of barrels, gas blocks, muzzle devices, bolt carrier groups, and charging handles, you can get the custom upper you need at the right price. Picatinny top rail perfectly aligns with the included billet upper, with matching finish and lines for a monolithic look. Perfect for assembling a new upper build – be sure to check out our selection of upper receiver components for completing a custom job! Once you’ve got everything installed, you’ll have plenty of room for M-LOK accessories and adapters. Billet upper receiver, handguard with aluminum barrel nut and all mounting hardware, one 5-slot M-LOK to-picatinny rail, hex wrenches for handguard and rail sections, and barrel nut wrench. Want to see the full kit in action? Check out 704 Tactical’s Review! I love it, couldnt be happier, highly recommend! Its bot done yet but here is the start of my build. Seams sturdy and very well built, the upper and hand guard match up perfectly for a sleek profile I really like the Barrel nut that comes with it and the way the hand guard attaches to it simple great design with no timming of the barrel nut. Will Definitely purchase again next time I build another upper. This combo is real sleeper! at the end of the line on a Google page. I ordered it the same day. Got to actually talk to Zak the CEO which only further comfirmed my choice. this a fabulous product for the price! Fit and finish is great. Handgaurd attachment very sturdy. Used for 6.8 spc build. Perfect! The combination of the upper and hand guard is very secure and solid. They match up perfectly. The hang guard has no shape edges to snag your hand and it is relatively light compared to other comparable hand guards. Yes, it does not have a forward assist but unless you are in the desert or under fire with a lot of debris, I feel as though it is not needed.